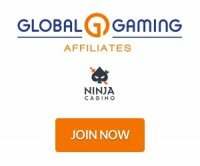 The affiliate program backend is powered by MyAffiliates and provides a dashboard for your recent statistics showing referred players and income. You can access everything in the backend powered by MyAffiliates. You can create campaigns to segment your traffic reports and the Marketing is where you get all of your tracking links and banners. You can even access their free games which gives you embedded games to provide for your websites. The affiliate program covers numerous brands so you'll need to monitor which brand gives you which commission rate. The rates can vary but you can also choose to get CPA for commissions.